Choosing the Right Car Accident Lawyer | Maggiano, DiGirolamo & Lizzi P.C. Pursuing a claim for personal injuries caused by a car accident can be both complicated and costly. And to make matters worse, some lawyers may not be equipped to pursue all claims and compensation available to you. Choosing the right car accident lawyer can save you time and unnecessary frustration, plus it will typically result in a larger settlement. The law firm you select should have expertise, years of experience with personal injury cases, and a proven track record of success. The attorneys of Maggiano, DiGirolamo & Lizzi are proud to fight for compensation for car accident victims throughout New York and New Jersey. We have pursued justice and compensation for thousands of car accident victims, and we are committed to the thorough investigation and fair resolution of your case. We have collected more than $300 million for our clients, and we have the negotiation and trial experience necessary to pursue any claim. Contact us at (201) 585-9111 or contact us online to schedule your free, confidential consultation. How many personal injury claims have you settled successfully? What percentage of your practice involves personal injury cases? How much experience do you have in auto accident cases specifically? How do you think my case should be handled? How will I be kept informed of the status and progress of my case? What kind of role will you personally have in the case? Do you plan to pass it along to another lawyer in the firm? Asking these questions can give you a better sense of the attorney’s history with and approach to car accident claims. At the end of the day, hiring the right motor vehicle accident lawyer boils down to experience, resources, and reputation. It is important to consider the type of experience your attorney has, as well. A record of success in simple car accident claims is often not enough; some of these successes should come from more challenging cases, such as those involving products liability and government claims for faulty road designs and dangerous conditions. A successful car accident attorney is one with the resources to do the job right. For the best chance of receiving a fair settlement, only consider law firms that are well-established, well-staffed, and well-financed. Investigating a car accident requires using forensic tools, conducting safety analyses, and developing a network of medical and economic experts to calculate your damages. Without the vast resources that this requires, your case will be under-prepared and you could lose out on certain compensation. 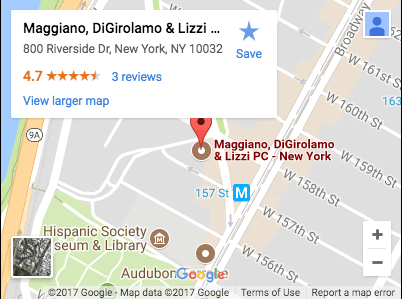 The Law Firm of Maggiano, DiGirolamo & Lizzi is known for using the latest technology to investigate and argue our cases. We spare no expense to pursue justice for our clients, and we are committed to bringing in only the best experts to research and testify in your case. A high level of communication, brainstorming, and research requires the best tools, and Maggiano, DiGirolamo & Lizzi have the resources to provide them. Certain things cannot be measured by the number of successful cases or the total amount of settlements. A law firm’s reputation in the community, among lawyers, and among insurance adjusters is crucially important when it comes to the success of your claim. Maggiano, DiGirolamo & Lizzi were voted Best Lawyers in America by their peers. Martindale Hubbell, the leading lawyer rating service in the country, once again awarded the highest possible ratings to Maggiano, DiGirolamo & Lizzi for professional skills and ethical standards, and we are listed in the Martindale Hubbell 2012 Edition of Preeminent Law Firms in America. Our attorneys are well-known and well-respected by fellow lawyers and by judges, and we are frequently requested by judges and lawyers alike to speak on legal topics across the country. Competing lawyers and claims adjusters may be able to wear out most lawyers, but they know they cannot wear us out. We are relentlessly committed to excellence and to your claim. Working with a personal injury lawyer—particularly one with an outstanding reputation—typically increases the size of your settlement amount by a large margin. Insurance adjusters are far less likely to take you seriously without the assistance of an attorney, and an inexperienced attorney can be just as detrimental to your case. The attorneys at Maggiano, DiGirolamo & Lizzi have handled thousands of auto accident cases throughout New York and New Jersey. We have consistently achieved exceptional results for our clients, and we have earned a reputation for professionalism and competence among lawyers, judges, and insurance representatives alike. The experienced attorneys at Maggiano, DiGirolamo & Lizzi are proud of their track record of success. Let us fight for you and ensure that you get the compensation you deserve for your injuries. Call (201) 585-9111 or contact us online to schedule your free and confidential consultation.